This is Robin Hood. He is the legendary mustang, owned by Phil Ottenger DDS, that is currently being ridden by Vicky Giles DVM. 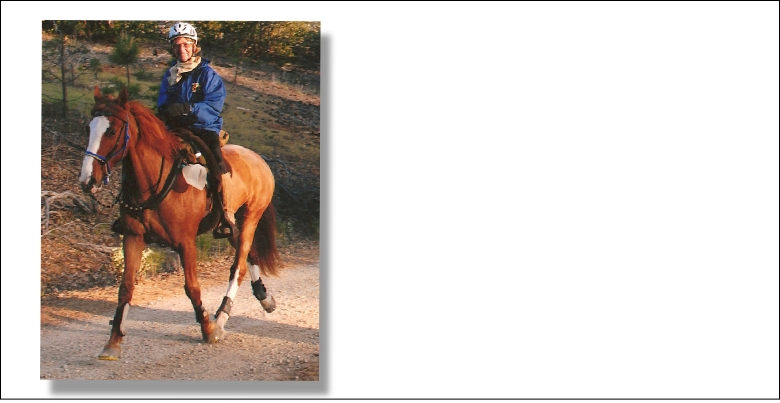 "Hood's" record stands with some of the best horses in the history of endurance riding. Through his over 10,000 competition endurance miles, he has been wearing Sneakers. He has been featured as a poster boy for Sneakers, the AERC and the BLM Mustang Adoption program. Please have a look at his record at the AERC web site to get a real appreciation of how much Hood has accomplished in is still continuing endurance career. Tired but happy after the closing ceremonies of the '96 world Endurance championships, Danielle and Valerie Kanavy stop for a photo opportunity for me with "Cash" and "Fire". 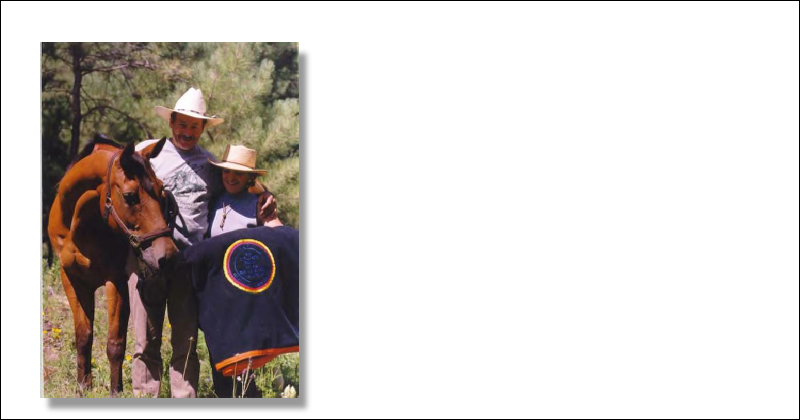 '96 was an extraordinary year for the Kanavys and we were happy to play a part. This is our good friend Marilyn Scholl on Joey. Marilyn has been riding in endurance since before the inception of the Sneaker. 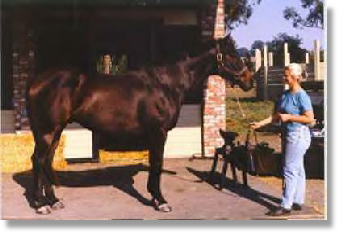 She and her horses were some of the Sneaker prototype testing team. So for more than 20 years, her many horses have worn Sneakers down the trails. 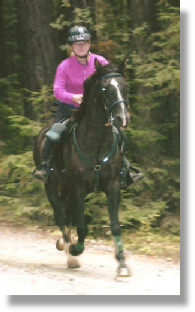 Joey has been Marilyn's mount for a decade in the sports of endurance riding and carriage driving. 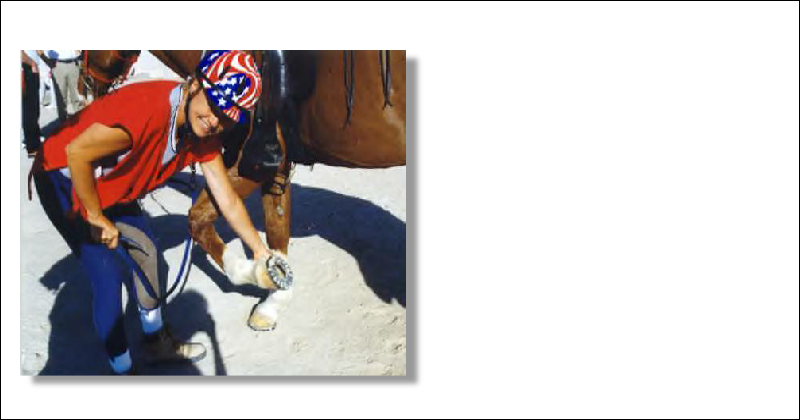 Michelle Roush DVM on Tallymark in Dubai, UAE during the World Championships. We appreciate her use of our shoes for more than a decade on all of her mounts. Please take a look at her impressive record of accomplishments on Tallymark on the AERC web site. I own Dino, a 16.2 hand Paint Horse that I ride in Parades all over California including the Pasadena Tournament of Roses. To reduce the impact of Dino's legs and joints as he prances down the parade route, our shoer recommended Sneakers for Horses designed and built by Kirk Adkins, UCD farrier. The Sneakers not only help my horse but I have a much smoother ride down the city streets. I recommend to all equestrian paraders - use the new Sneakers. Both you and your horse will be much happier! La La Land developed a serious fungus infection (White Line Disease) in the right front foot and Barbara was referred to Kirk for treatment. The coffin bone radiographs showed pedal osteitis and some slight laminitic changes, which caused him to be consistently lame and not able to work. Treatment of the fungus infection progressed in a couple of months to a point at which Sneakers were applied. They provided the support and concussion reduction that this big horse needed to help heal his hoof and return back to soundness. La La Land went back to jumping. He remained in Sneakers for 4 years until his passing away from a mysterious liver disorder in the summer of '98. Henry Christmas wasn't sure how well things would turn out when he showed up at the '98 Western States Ride (the Tevis Cup) needing shoes the day before the ride. Fortunately for him a fellow rider convinced him the only shoes for the ride were Sneakers. He finished in great shape on that race and continued to use the shoes. He finished in the top ten in all the rest of his rides in '98 and '99. Henry and Dakon won the heavy weight best condition at the '99 AERC Championships in New Mexico. 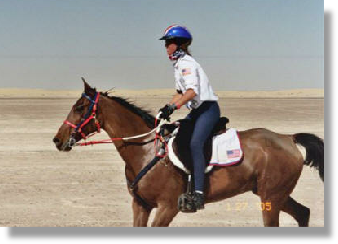 Patti Pizzo had a rough start to the '98 World Endurance Championships in Dubai, UAE. Sam went through an especially frightening tying up episode before the race. With great credit to the expertise from all the team members (vets, riders and crewmembers) Sam recovered. Then only 4 days before the ride Sam showed some lameness in his left fore. The Chef d'equippe Rick Stewart and team veterinarians Mike Tomlinson and Nancy Elliot persuaded Patti that Sneakers offered the best chance for Sam to overcome his sore heels. The rest as they say is history. Patti and Sam finished the race right alongside Shirley Delsart our 4th US Endurance Team member. Patti continues to use Sneakers and placed 2nd at the '99 Old Dominion Ride in Virginia. To whom it may concern, When the Sneakers arrived in the mail that you sent us to try, we could hardly wait to get the box open. 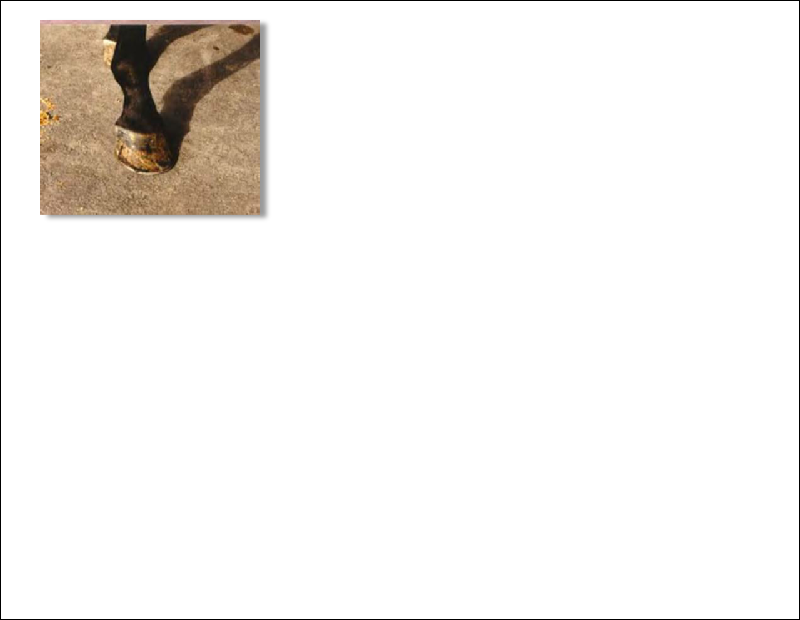 We had never seen shoes for a horse that were anything like this, with a big tread, and a hole in the middle! We passe them around, banged them on the ground, stood on them, surprised at their quietness, trying to get a feel for what they were all about. Our farrier, Don, was quite excited, as he had recommended that his favorite client experience the comfort of Sneakers' shock absorbing material so that Beau would be more comfortable carrying his precious students. 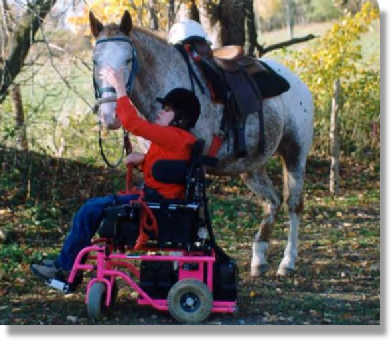 You see, Beau is a lesson horse for disabled students of all ages and abilities. He participates in the New York State Special Olympic Program, and his students are what makes the light shine in his eyes. Beau proudly carries riders with the severest of disabilities safely, enabling these individuals a chance to experience independence that they might not have anywhere else in their lives. Some of these individuals use wheelchairs, and cannot sit up unaided, needing the help of a backrider to assist them in participating in lessons. Some of his students cannot speak, or see with their eyes. Students who are severely retarded, or have Autism. If you watch Beau at work, it's easy to see that he is proud of the work that he does, and truly loves his special riders. And he needs to be more comfortable than regular shoes can make him. Beau suffers with navicular, and some days are rough for this horse with the big heart. Nothing about Beau is small, and this can mean that the pain he experiences is enough to make his lessons too hard to participate in sometimes. He never complains, and his students don't need to know of his discomfort, but we were concerned, and Don strongly suggested that we give Sneakers a chance to work for him. Beau understands that something is different now, he doesn't favor his front legs like he did, and actually can enjoy an occasional trial ride. The difference is truly remarkable and his students appreciate his smoother gaits. Beau doesn't have the discomfort anymore that he used to as his carries them carefully and happily during their lessons. They only know they love this big Appaloosa that has worked his way into their hearts, helping them to be more independent. The horse that forgives an inexperienced rider's tug on the reins, or a too sharp kick. A caretaker that stands quietly at the mounting ramp for a frightened child to get up the courage to sit on him, then moves slowly and gently with him, offering a quiet strength and understanding too sweet for words. What Beau offers is more than a lesson, and nothing short of pure love for his special riders. His Sneakers will allow him to continue this work, and be comfortable while doing it. After all we need to take care of this caretaker. Thank you for sending us these Sneakers. We can't imagine Beau working without them, and we don't want him to ever again! God bless you Kirk Adkins. Tears filled my eyes. I'd just flashed on how our Poquita was moving last year. Short, choppy, painful strides, and how that made my heart ache. Oct. 1995--- on the last leg of a 6 hr. ride --- down hill, hard, rocky dirt road. Our Poquita was making long, smooth, easy strides. We stopped often for our friends to catch up. One was riding a 12 year old Arab, the other a 13 yr. old Doc Bar Quarterhorse. Poquita is a 19yr old Appy and has had 7 babies. From July of 92 until Feb 95 our lives were filled pain for Poquita and heartache for me. What a nightmare! 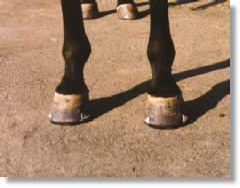 Shoes on shoes off- pads on pads off- lifts on lifts off- hand made bar shoes- bar shoes- TheraFlex pads- rim pads- 'Level it'- Glue on's- Slypner Athletic shoes-Xrays, bute, herbs, homeopathy. Lots of things worked for a while but nothing lasted. I was at the end of my rope--and way past the end of my money. Our vet Dr. Paul Miller had recommended Sneakers. The only one he had to show me was old and worn out. I didn't like the way it looked. How exasperated he must have been! Paul had been with us the whole long 3 years and through four different farriers. I called Dr. Kerry Ridgeway to see if acupuncture would help ease Poquita's pain. He said that nothing he could do would last if her feet were not balanced and comfortable. He also suggested taking her to Kirk. Feb 1995- Poquita goes to see Kirk for balancing and Sneakers. It is unbelievable! These Sneakers have made a veritable TANK out of our lame, tenderfooted Poquita. Where we used to turn back it is now "Get out of our way, were are coming through!" What a great feeling! Sneakers might seem expensive at first, but believe me compared to multiple vet and farrier visits they are not expensive at all. Oct 1995- Waiting for my friends to catch up- I made a fist, thrust my arm in the air and the words "God bless you Kirk Adkins" echoed across the Mc Cloud Valley. Thanks for creating Sneakers. Thanks for the most fun summer Poquita and I have ever had. This is Gaelin Arbios DVM on one of her numerous mounts. She has been a Sneaker supporter and recommender for many years. 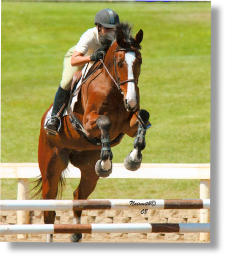 She and her “Sneaker shod” horses can be seen competing in various jumping, dressage and endurance competitions throughout Northern CA.